Filter coffee machine in the design of the 50s. After the iconic espresso coffee machine, Smeg presents a new product to satisfy aroma lovers everywhere: the filter coffee machine. In terms of looks, this new addition is a true style object, in perfect harmony with the design that characterises the 50’s Retro Style range. Moreover, it is also a hub of technology, guaranteeing ultimate performance for a totally unique and personalised sensory experience. Filter (or ‘Americano’) coffee is a pleasure to be savoured slowly, and is often associated with the idea of a long, relaxing break: the ideal companion for a day at work with your cup on your desk, to be enjoyed at breakfast or lunch, or to take with you when you leave the house - a pleasant companion to combat the hustle and bustle of your day. 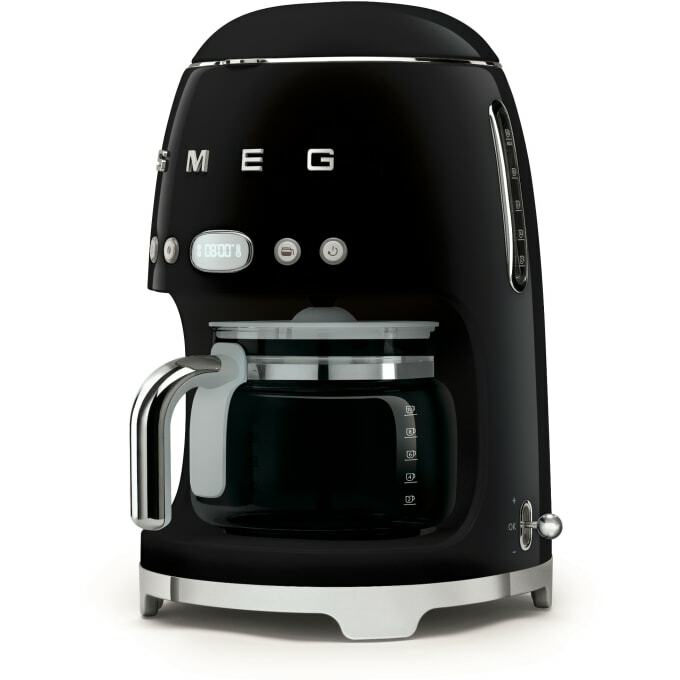 The Smeg filter coffee machine enables you to treat yourself to a little everyday luxury, allowing you to prepare a deliciously aromatic, richly-flavoured coffee with the option of selecting the aroma intensity you prefer, to satisfy both the most delicate palates and those in search of more intense flavours. This appliance combines high levels of performance with a unique design, making it an object to show off and testifying to the dedicated research carried out by Smeg, with a view to creating style icons in which the harmony of shapes and forms marries with the more functional, technological components. Its sleek lines embrace the painted stainless steel body, available in black, red, white, cream and the more delicate shades of pastel blue and pastel green. Furthermore, the Smeg filter coffee machine is also equipped with an aroma setting button (ranging from intense to delicate) and an LED digital display and clock/timer with Auto Start function for setting the time for the machine to switch on automatically: a host of functions that enable the various features of the machine to be fully personalised, with excellent results for all requirements. Thanks to the 4 cups function, you can decide whether to treat yourself to a coffee alone or in company, and that’s not all: the filter coffee machine is also equipped with a glass jug that can hold up to 10 cups, with a Keep Warm function that ensures optimal coffee temperature for 20 minutes, so you can enjoy a cup a little while after you have prepared it. These are the details that really make all the difference, for a range of appliances that can meet the functional and aesthetic needs of the modern customer. In true Smeg style! Keep warm function for max. 20 min. Do you have a question about "DCF02"? How can we contact you?